With a bush charter plane organized by us together with the other hunters on your hunt. What is the weather going to be like? /What clothes should I bring? Variable. Be prepared with everything from t-shirt to woollies every day throughout the season. And the outfitter is letting you know that it is always huntable with a success rate of about 100% over the past 15 seasons. Does my guide know the area? He knows how to guide in the north, read a map and a GPS and gets clear directions from the outfitter. We try to spread out hunting pressure so still sometimes hunt areas we have only been in from the air, not on foot. We go where the game is and the helicopter gets us there. Do I really need such a large backpack? Should I bring a small one and a bag? You really need a 90 l (5600 cubic inch) backpack. It contains all your gear coming into the country, it serves as your daypack (the rest of your stuff stays in the tent), you will carry your sheep and gear back down the mountain with it. If you don’t bring one, we will give you one. Can I extend my hunt? Theoretically yes, but practically it has only become necessary about two times in 15 years, so don’t worry about it. Can I take my seven year old with me? Only if the time with your kid is more important than the hunt. There are no instant helicopter pickups for child care in base camp, while you keep hunting. When should you bring your child then? When they are big and strong enough to scale the mountains and that depends on the individual. The one you are most comfortable with – from .270 WinMag via 30.06 or 300 WinMag to a .338. All of these work for all the game we have. Contact us, get an offer, decide, then you will receive a hunting contract locking in your price and date. A deposit of 25% of the hunt price and a corresponding receipt from us completes off the reservation/booking. Do you have an equipment list? Yes. It is detailed for your hunt and will be sent to you prior to your trip. Do I have to bring camping gear and backpacking food? No. All gear apart from your sleeping bag and mattress will be provided, including high quality backpacking food. Freeze dried Mountain House, jerky, cheese, salami, cans of fish/meat, bread, trail mix, granola and chocolate bars, dried fruit, etc. There is usually at least one year lead time on all hunts, sometimes more. On occasion hunts open up again. Up to a year before the hunt everything apart from a 10% booking fee will be returned. Within a year of the hunt no reimbursement of funds, but you can send a replacement hunter. Travel insurance is a good thing! What if we don’t see a ram (or moose)? You will see respectable trophy animals at shooting distance. If everything goes wrong (wolves, weather, etc.) we will offer to extend your hunt. If you can’t walk or shoot there is nothing we can do. No refunds are given if you don’t get ‘your’ ram or moose. This is a wilderness hunt, not a guarantee in a fenced area. Do we come back to base camp every night? No. You will be spike camping while hunting as it is impractical and costly to fly everyone back to base camp every night. Flying distances from camp can be up to one hour one way. You will stay out hunting till you have your game. Will I be backpacking with my entire camping gear every day? No. You will be going out with day gear only. The rest stays in your spike camp which is already situated in the actual hunting location. The helicopter lands on the mountain top, right? Mostly not. Your spike camp will be in a flat, landable area with drinking water which is mostly found in the valleys. You will not backpack your gear. How do I get the rifle into Canada? Very easily. You will be provided with a document by us. Fill it in, show it and the rifle at customs, pay $50 and that is it. How do I get the rifle onto an airline? Advise the airline at time of booking. Separate rifle and ammunition in two pieces of luggage. Above all, find out before getting your plane ticket what rules the particular airline has. What elevation are we hunting in? 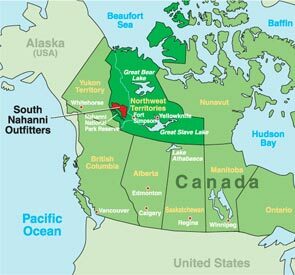 What is the starting off point/fly to destination in Canada? Whitehorse, Yukon, Canada. From there we fly to NWT. Can I site in my rifle? Yes, we regularly have everyone shoot their gun upon arrival in basecamp (up to 1000 m/yards available). What do I need to enter Canada? Can I bring my handgun? Absolutely not. No hand guns allowed in Canada apart from at the shooting range. How old does my child need to be to hunt? 12 years of age at the time of hunt to hold his/her own tags. If younger then he/she can hunt on the parents/guardians license. Can I take my trophies and meat home? You can take it into the States or across Canada, but not overseas. You do need an export permit, issued in Fort Simpson, east of camp. An extra flight will have to be made and paid to get to the officer there as we come in from Whitehorse, west of camp. Do you have Grizzly bears? Can I hunt them? Are they dangerous? Yes, this is grizzly country. 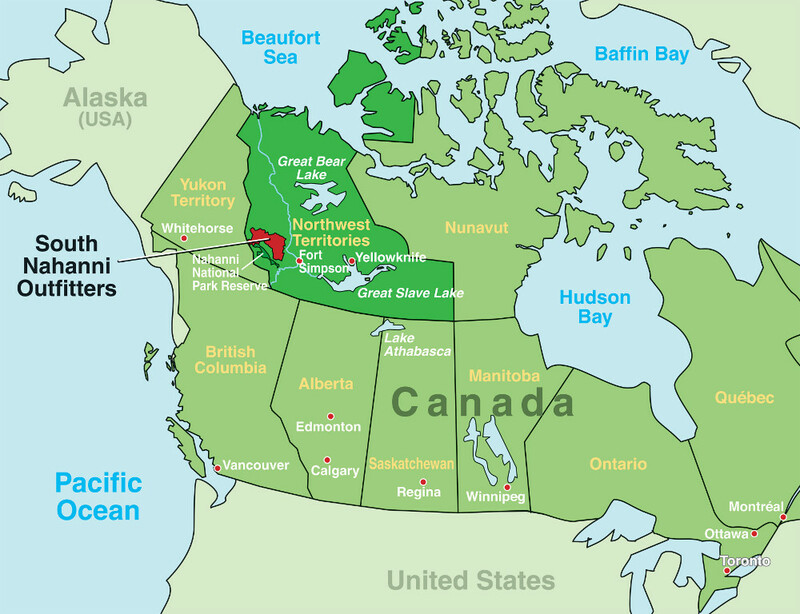 You cannot get a permit unless you are an NWT resident. We take bear defence measures. You cannot keep a bear shot in self defence. Our guides are well prepared to keep you safe.